Octopus is a very popular dish in Malta. The most traditional recipe is Stuffat tal-qarnit which is octopus stew in tomato sauce. In Portugal, octopus is also very popular being one of the dishes eaten during Christmas Eve along with codfish. 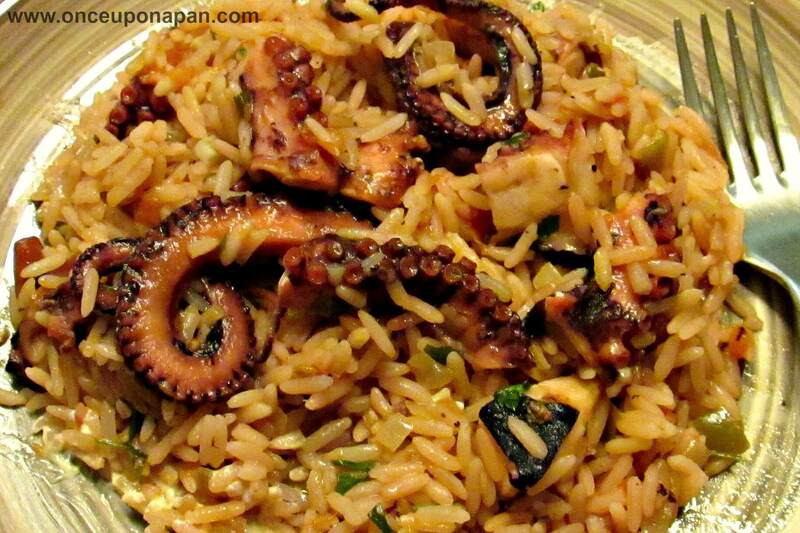 But in the coastal areas, from where I came from, we like Octopus rice. The base is the same as the stew but less tomato sauce. And instead of potatoes, we add rice. I find it to be a delicious dish where you can enjoy the taste of the octopus without others flavours overpowering it. In the north of Portugal, one of the traditional dishes for Christmas is Octopus stew. It’s very similar to the Maltese recipe. But we always add vegetables to it like carrots and potatoes. I believe that in Malta, potatoes are not always used and sometimes the stew can be used as sauce for pasta. I like all these recipes as I love octopus and I think it all goes very well together. Once cooked cut into pieces. In a pan with the olive oil saute the onion, garlic, pepper and bay leaves. Add the rice and fry it a little. Add the wine, the water where you cooked the octopus and approximately 500ml of boiling water. Bring to a boil and add the chopped parsley. Mix it all together. Cover the pan, turn off the fire and let it rest for just two minutes before serving.